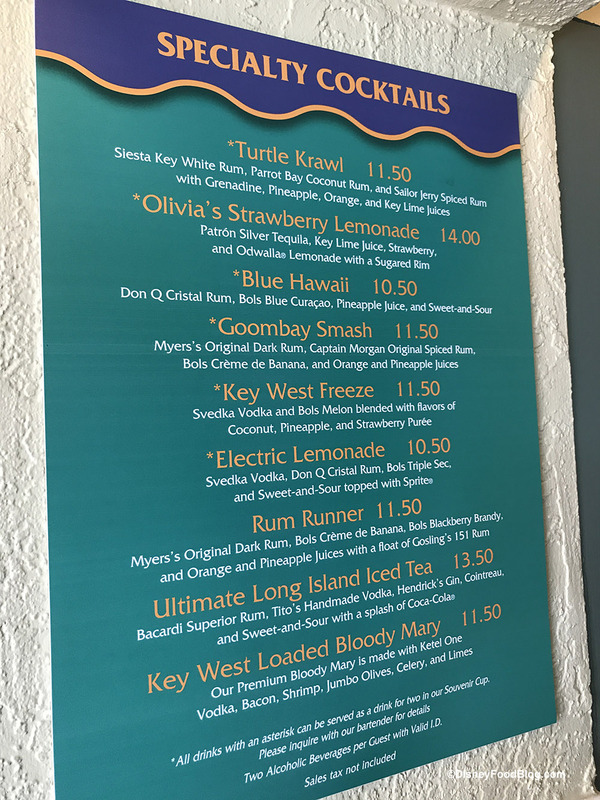 What’s New at Old Key West and Saratoga Springs Resorts: Updated Menus, New Merchandise, and New Events! We were in the Spring Break mood so we headed to Key West…Disney’s Old Key West Resort that is! 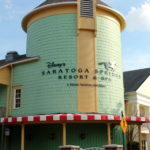 After our tropical escape we headed to Saratoga Springs Resort. On our “travels” we found new menus, merchandise, cupcakes, and wine and mixology seminars! Our visit to Old Key West’s Gurgling Suitcase was full of new menu items! Gurgling Suitcase has debuted a few new menu additions over the last few months. 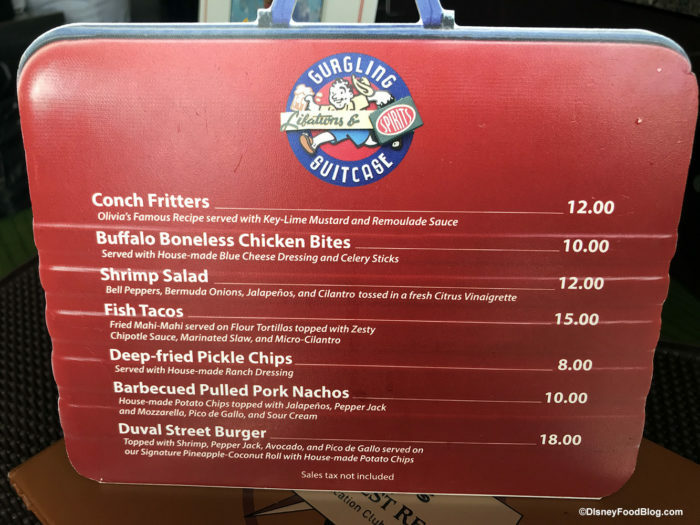 The new items on this visit included Buffalo Boneless Chicken Bites, Barbecued Pulled Pork Nachos, and Deep-fried Pickle Chips — of course we had to try them all! 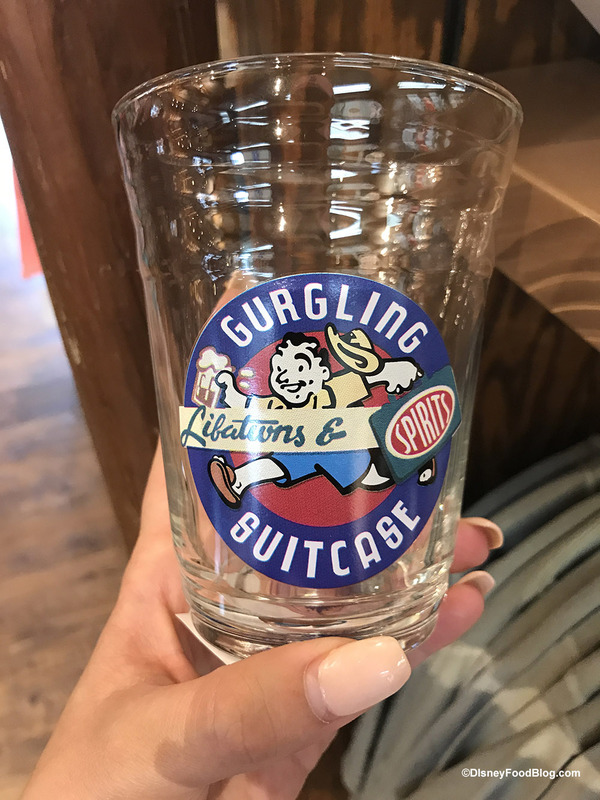 Read our review of the additions to Gurgling Suitcase’s menu here! With a name like Gurgling Suitcase Libations and Spirits, you can expect a Libations and Spirits menu to go along with the eats. 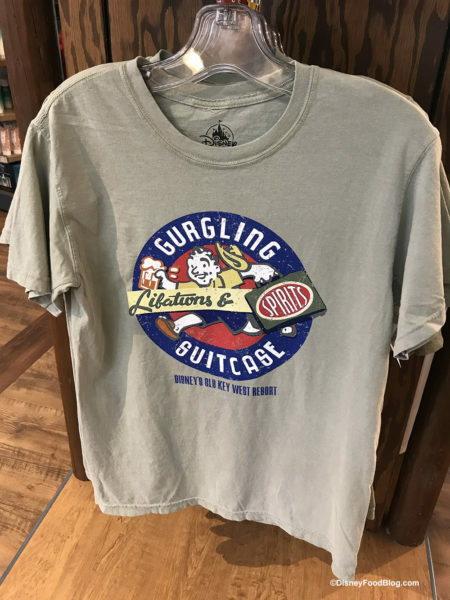 We also spotted a new Gurgling Suitcase shirt and glass in the gift shop. When we stopped in Olivia’s Cafe we learned there is a new culinary team in place and that we will be seeing changes to the menu soon. 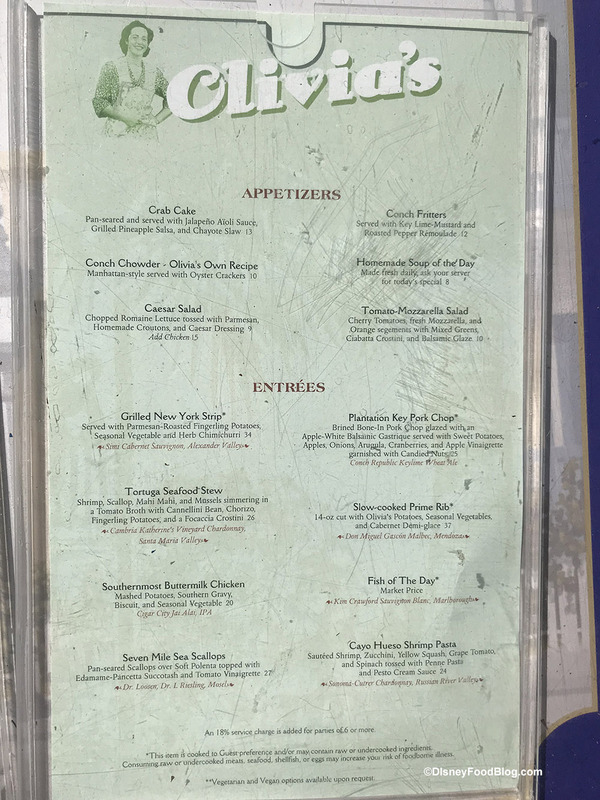 As always, we will be sure to keep you up-to-date on the changes here and will bring you a review when new items are added to Olivia’s Cafe menu! 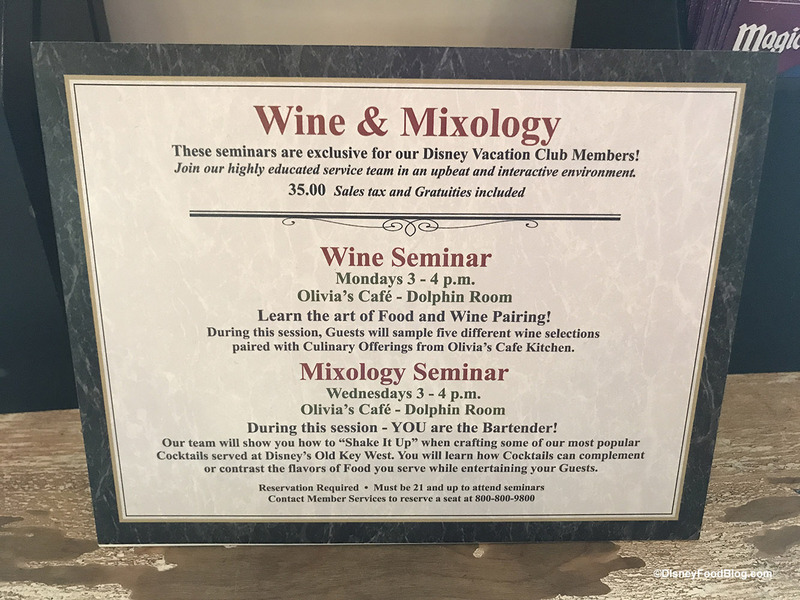 If you are a DVC member be sure to check out the Wine Tasting or Mixology Seminars offered at Old Key West. The wine tasting program includes samples of five wines along with food pairings; while the mixology seminar lets you become a bartender, as you learn to create some of the resort’s most popular cocktails. 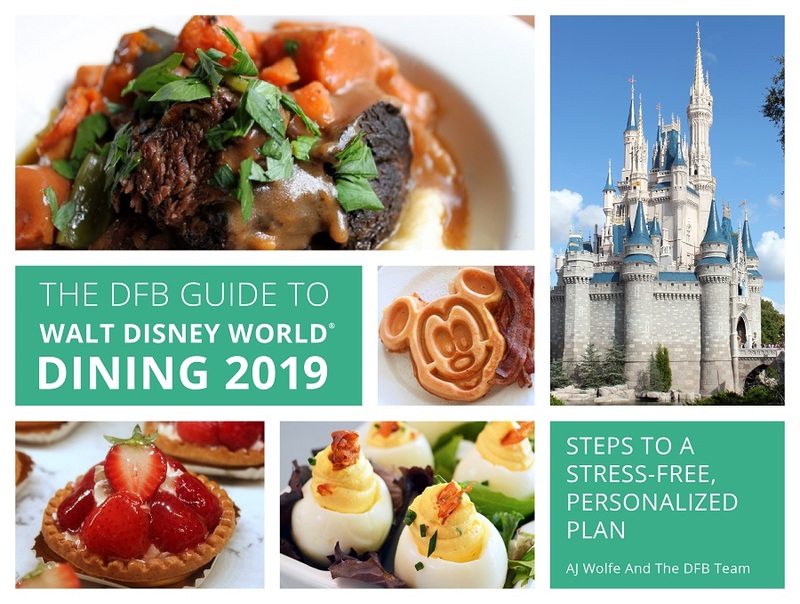 Non-DVC members may sign up for the seminars on the day-of the seminar, if there are any open spots, but can not reserve a spot in advance. The Artist’s Palette is home to what may become Disney’s newest color craze! 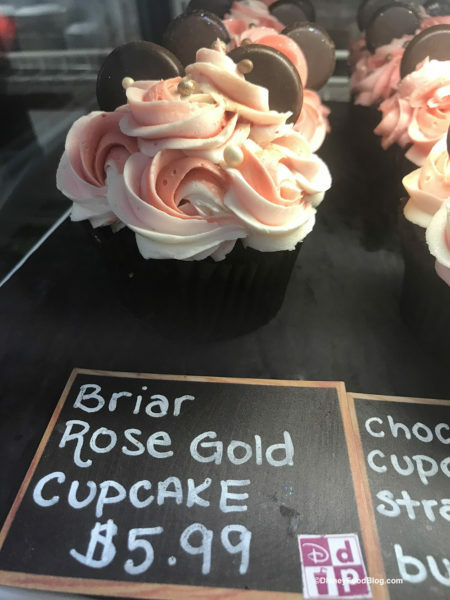 Move over purple potion — here comes briar rose gold! We know briar rose gold Minnie ears are coming to the parks in April — and Artist’s Palette is ready for the new craze with a Briar Rose Gold Cupcake! 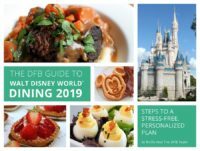 We hope you enjoyed spending spring break with us 😎 — check back soon for MORE tasty updates from the Walt Disney World resorts! 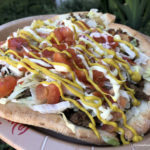 Be sure to stay up-to-date on all of the weekly updates in the parks with our What’s New posts. Catch up on Epcot’s latest news here — which is jam-packed with construction updates and more! See all of Hollywood Studios’ news here — including Star Wars: Galaxy’s Edge construction progress! Read about all of the updates in the Animal Kingdom here — including Chocolate Donut Holes and a new Otter Grotto! 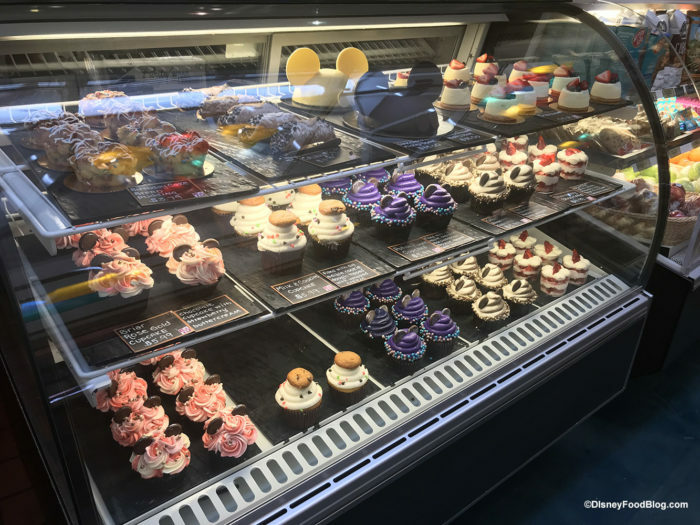 Learn about all of the new items in the Magic Kingdom — construction updates, new brownies, new merchandise, and more! Check out our video 12 Times Disney Imagineers Have COMPLETELY Blown Our Minds! When you’re done – check out all of our Videos on You Tube! 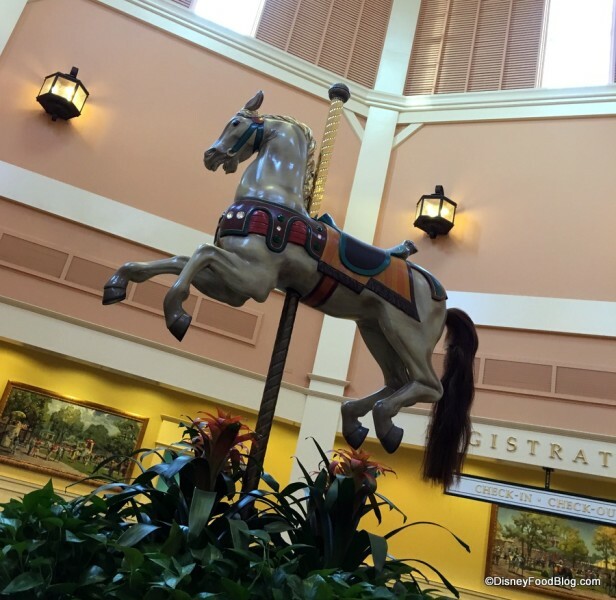 Is Old Key West or Saratoga Springs your DVC home or favorite resort? Let us know in the comments where you love to eat at these resorts! 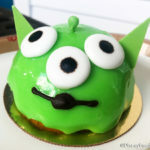 Will You Choose The Chosen One Dessert at Disney’s Saratoga Springs Resort? If you get a chance to do the DVC Wine Seminar, do it! It was great fun and the food and wine was yummy. It wasn’t stuffy like some wine tastings can be. 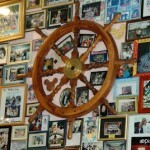 In fact we met some wonderful new DVC friends and ended up at the Gurgling Suitcase with them after the wine seminar. It was our first time visiting Old Key West and loved the vibe! 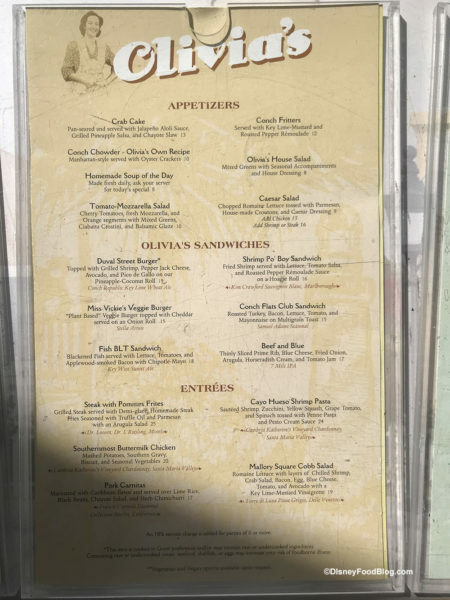 I’m glad to see the Gurgling Suitcase has added some menu items too! How do we sign up for wine tasting? We will be there Nov. 4. C Scherger, DVC members can book in advance (try contacting DVC or the resort directly), and all other guests can book on the day off (see the front desk). 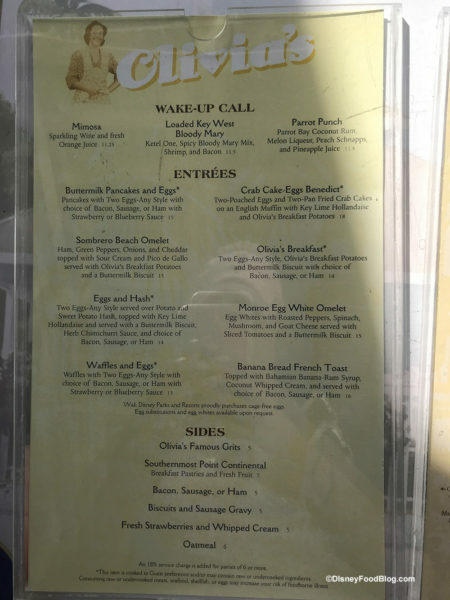 I hope they don’t mess with the perfection of the breakfast menu! 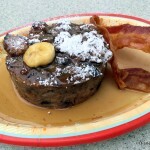 We have been enjoying banana bread French toast and Crab Eggs Benedict since we joined DVC years ago!